This supplement is designed to aid in natural weight loss by providing appetite control, slowing the absorption of sugar in the liver, and by stimulating the metabolism. It is made in the USA in FDA-registered facilities. This 90-capsule bottle is designed for 45 days of regular use. 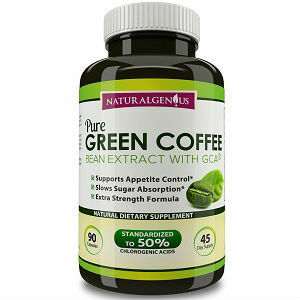 This product is formulated with 800mg of green coffee bean extract with 50% chlorogenic acid contained in a vegetarian capsule. It is free of wheat, yeast, soy, eggs, dairy, shellfish, sugar, tree nuts and peanuts. Chlorogenic acid is a powerful antioxidant that has been shown to lower blood pressure and produce weight loss. This supplement does contain caffeine, though the company does not state exactly how much. As caffeine is a stimulant, it contributes to some of the weight loss effects, but can have some side effects, especially for those who are sensitive to it. Natural Genius recommends taking one capsule 30-minutes before a meal, up to twice a day with a full glass of water. Because of the presence of caffeine, it advisable to take this prior to breakfast and lunch. Because of the limited number of ingredients, the only side effects from this supplement are those related to caffeine. These include mild headaches, upset stomach, trouble sleeping, jitteriness, and increased anxiety. Those who are particularly sensitive to caffeine should avoid this product for this reason, as these effects could be enhanced. The manufacturer recommends consulting a health professional before taking this product and strongly discourages taking more than the recommended dosage. Women who are pregnant or breastfeeding should consult their doctor before taking this supplement, and it should not be given to children. Through the company’s website, the 90-capsule bottle is currently on sale for $39.98, down from $64.98. There are a number of savings available for purchasing in bulk, and the company offers free shipping on orders over $50. Natural Genius offers a 60-day money-back guarantee on all of its products and boasts a customer service telephone line open twenty-four hours a day, seven days a week. Reviews for this product on the website are positive, with the vast majority rating it five stars out of five. These factors combined speak to a high level of efficacy and quality consistent with pricing. The high standard of quality in which the product is manufactured, and that it contains only two ingredients make this product attractive for those suffering form allergies, who are vegetarian, and who who are avoiding binders and artificial ingredients that can cause uncomfortable side effects. The 60-day guarantee, and positive reviews indicate the efficacy of the product, as the company is willing to stand behind it. The price is a definite downside, as it is more expensive than many similar products on the market, which also means this product can become even more expensive with long-term use. Edward Tobias	reviewed Natural Genius Pure Green Coffee	on December 13th	 and gave it a rating of 3.5.